Like any activity or sport, there are risk and dangers you need to be aware of. going to the beach and trying to surf with their dog. Millions of people enjoy the beach everyday without any issues at all. But, that doesn't mean that you shouldn't be aware. Even the sandy beach can hide some dangers. Broken glass, sharp rocks, rusty hooks and other fishing gear can hiding in the sand, seaweed or in the water. Can't tell you how many times I've step on a broken piece of glass going surfing. It's not uncommon for fishing tackle (hooks and fishing line) to be tangled up in seaweed and kelp that washes up onto the beach. It's not a good idea to let your dog jump into and play with the seaweed tht's washed up on the beach. It can be hiding a nasty surprise. 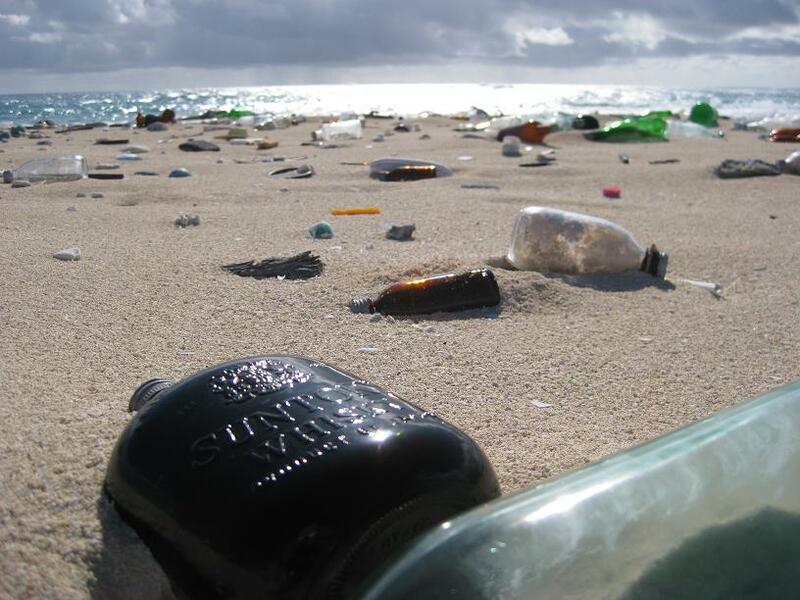 Please, if you see any of these things on the beach, pick them up and throw them away! In the summer, the sand can be incredible hot. REALLY HOT! Watch that your Surf Dog doesn't unknowingly burn the pads of his paws. FOR YOU, Sandals, flip flops or beach shoes offer some protection. If you’re not a surfer or a waterman, please be careful in the surf. Only surf where there are lifeguards present! Don’t go out in a large swell. If you’re not comfortable with your abilities and the size of the waves, come back another day. Be aware and careful of rip tides. if you end up a rip, stay calm and swim parallel to the beach. Stay calm! If you get hit by a large wave, relax. You will come back up. If you panic and try to swim, you may be swimming down, not up. Relax! Don’t surf for 72 hours after a rain. There are a lot of pollutants washed down the river valleys and out into the surf. Most Dog Beaches in San Diego are Beach Breaks with a sandy bottom. Occasionally a storm washes some of the sand away. Be carful not to step on sharp rocks, broken glass or debris. Some people wear aquatic shoes or booties when they go out. There are Sting Rays in our waters. Plenty of them. Shuffle your feet when going out especially first thing in the morning. Booties don’t help much! First time I was stung, it was right thru the hard rubber part of my booties! If you do get stung, Stay Calm! Go directly to a lifeguard station. The only thing that stops the pain is HOT WATER! The toxin is neutralized by the hot water. Don't pee on it. This will only infect your foot. Most Lifeguard stations are set up to soak your feet in a deep sink with hot water. If no Lifeguard is around, head home. Typically you have 5, 10 or 15 minutes before it hit’s you. 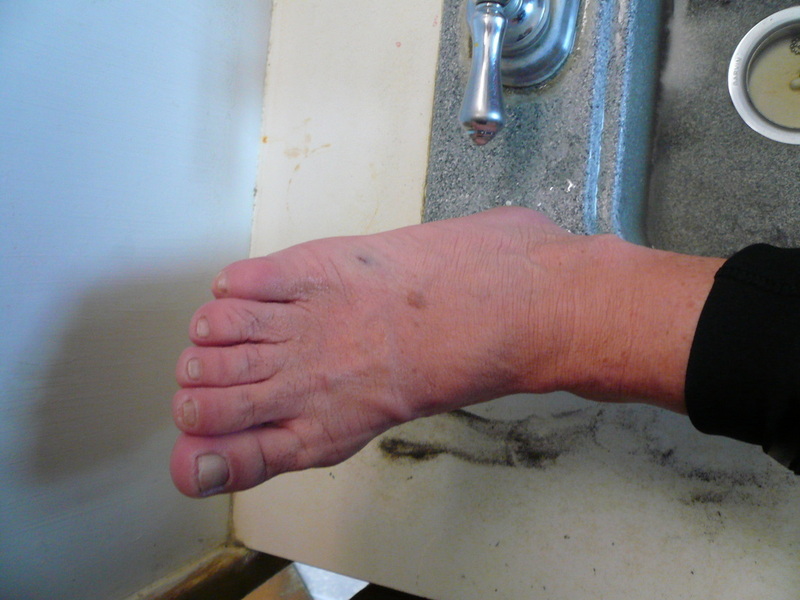 Put your foot in as hot water as you can stand and keep adding fresh hot water. Hot water is the only thing that breaks down the toxin! In no time at all most of the discomfort will go away. If your not sure you were able to clear out any remaining parts of the sting rays barb, go to your doctor before an infection sets in! Here's SoCal Surf Dog member Pattie getting help at the Life Guard Tower in Del Mar after she got hit on Sunday, May 8, 2011. Here's a close up of the small, razor like cut of a Sting ray wound. We occasionally get jelly fish here in San Diego. 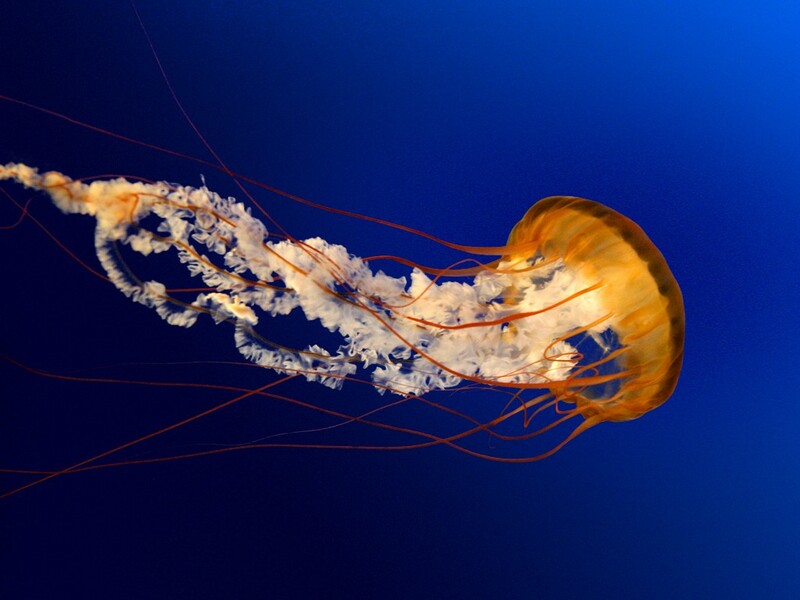 If you see one and aren’t familiar with jelly fish, assume its’ poisonous and get out of the water. Your Surf Dog isn't going to be watching for Jelly Fish, so be alert! 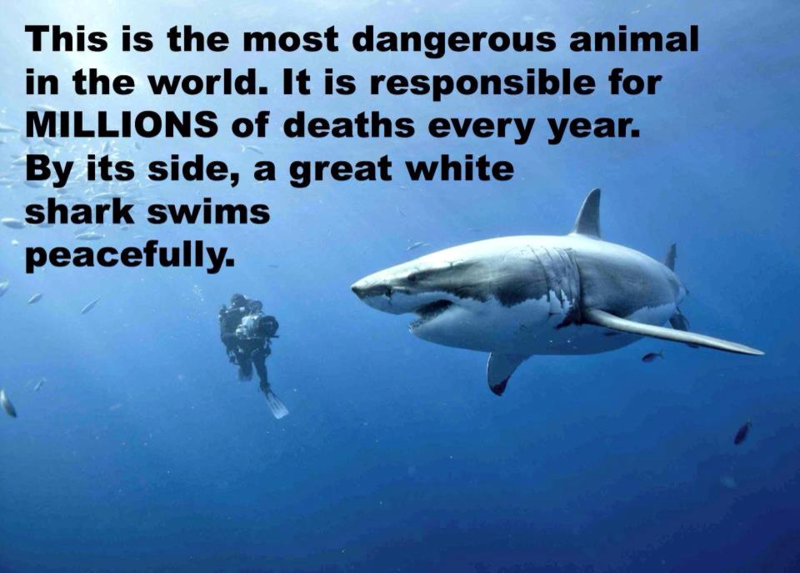 Yes, there are sharks out there! Most of them here in San Diego are harmless. It's clearly not a good Idea to be surfing your Surf Dog in waters know for aggressive sharks. Here in San Diego you have a better chance of getting struck by lightning than getting attacked by a shark. Don't swim in the Ocean for at least 72 hours after a storm. Swim in water polluted with human and animal waste and you can develop symptoms such as stomach ache, nausea, vomiting and diarrhea or flu-like symptoms such as fever, sore throat and coughing. In highly polluted waters, people can be exposed to hepatitis, cholera and typhoid fever. How are swimmers exposed to sickness-causing bugs? By swallowing contaminated water, mostly, but in other cases it's the result of direct exposure to bacteria via the skin, eyes or an open wound. 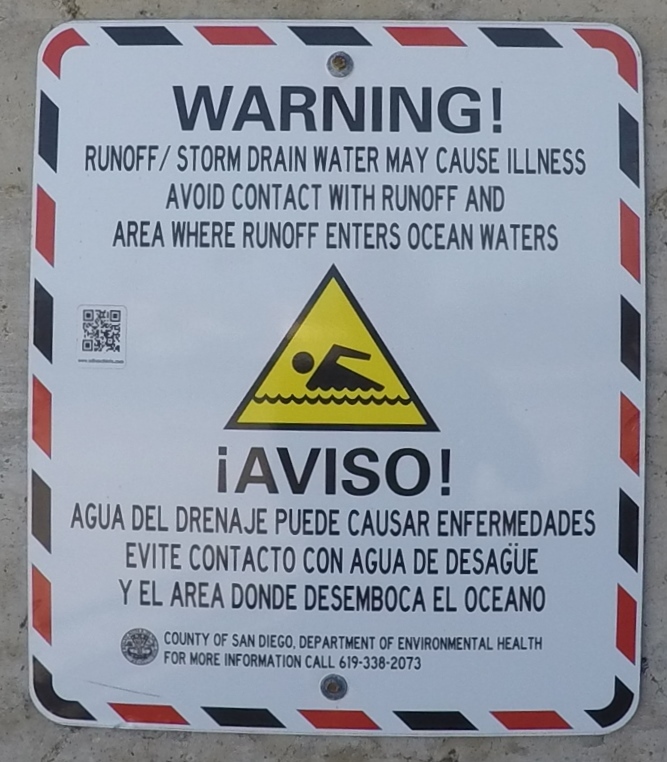 Most beaches post "No Swimming" or "Water Contaminated" signs to warn people away when pollution reaches unhealthy levels. This applies to you and your dog! See Chapter 12 "Going Home" about bathing your dog and rinsing their ears after surfing! Red tide is a common name for a phenomenon also known as an algal bloom (large concentrations of microorganisms), an event in which estuarine, marine, or fresh water algae accumulate rapidly in the water column and results in discoloration of the surface water. It is usually found in coastal areas. Some red tides are associated with the production of natural toxins, depletion of dissolved oxygen or other harmful effects, and are generally described as harmful algal blooms. The most conspicuous effects of red tides are the associated wildlife mortalities among marine and coastal species of fish, birds, marine mammals, and other organisms. Read more on Wikipedia at: http://en.wikipedia.org/wiki/Red_tide. It's just not worth the risk! pushed beyond its capability to cool. when the sun is highest in the sky. Drink plenty of water to prevent dehydration and don't overdo the exercise. sometimes unconsciousness. Call 911 or get the victim to a hospital right away. cool bath or sponging to reduce his body temperature. tend to be hit hardest by the heat. The Suns ultraviolet radiation is the foremost cause of skin cancer. Don't go into the sun without first applying a sunscreen. (Sun Protection Factor) of 15 or greater.